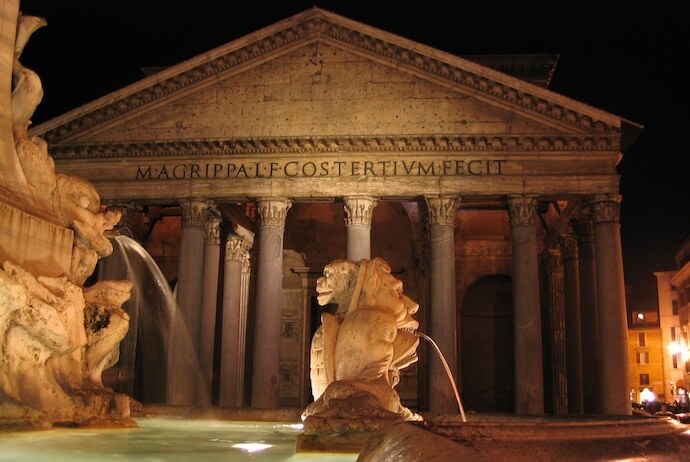 Rome is rightfully known throughout the world for its artistic masterpieces, historic wonders, and culinary treats. Unfortunately, hordes of tourists and high prices often prevent travelers from fully appreciating everything the city has to offer. Thankfully, visiting Rome doesn’t have to involve fighting through crowds or spending a ton. 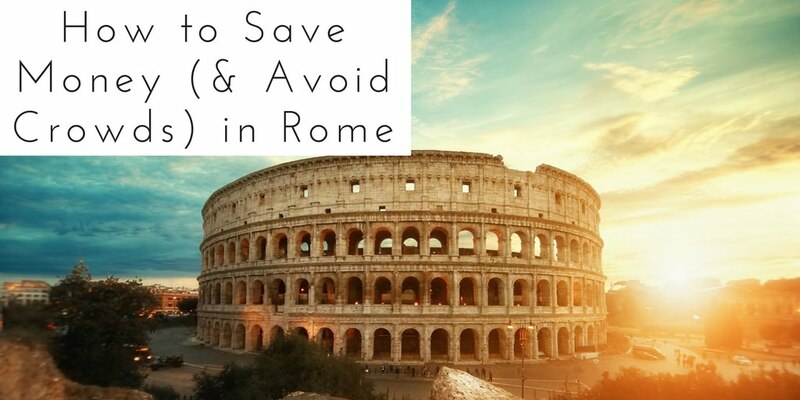 Here are 5 things I discovered while living in Rome that you can do to save money and avoid crowds. 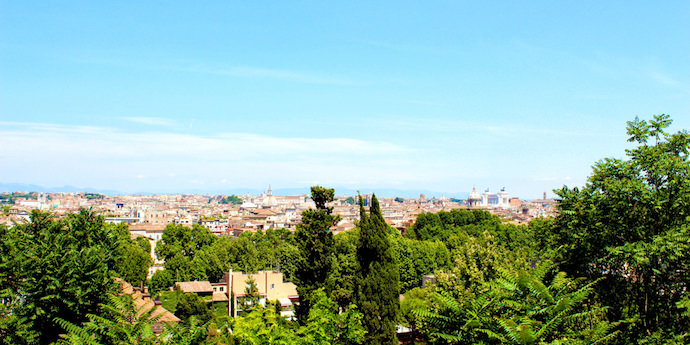 View of the Roman cityscape from the Gianicolo Hill. Often overlooked, the Gianicolo Hill provides visitors and locals alike with a beautiful and quiet escape from the bustle of downtown Rome. Located behind the Trastevere neighborhood, on the southwestern side of the Tiber, the Gianicolo Hill is a short walk from the city center. 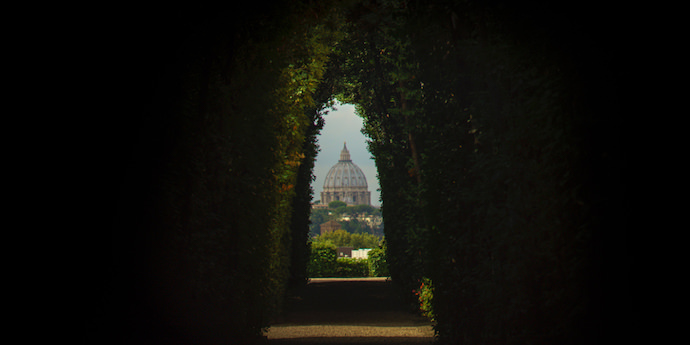 The park at the hill’s summit is the best location from which to view the regal villas, magnificent churches, and ancient ruins that make up the Roman skyline. Sure, you could brave the crowds and pay to visit the Dome of St. Peter’s Basilica or the Altare della Patria, but this view is free AND you get to see both buildings from here. As an added bonus, you can stop at the San Pietro in Montorio [see below for more details] on the way up. 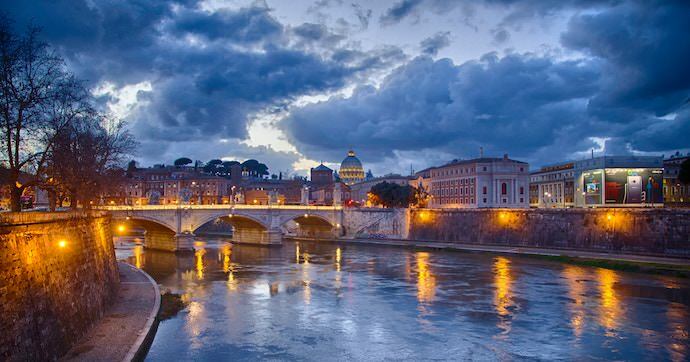 A nighttime view of the Tiber River with the dome of St. Peter’s Basilica in the background. Piazza San Pietro: Just in front of Saint Peter’s Basilica, this is the perfect introduction to Rome at night. Look at the massive colonnades on both sides of the Piazza. Designed by the Baroque artist Bernini, they were intended to resemble arms pulling the visitors towards the Catholic Church. Piazza San Pietro at night. 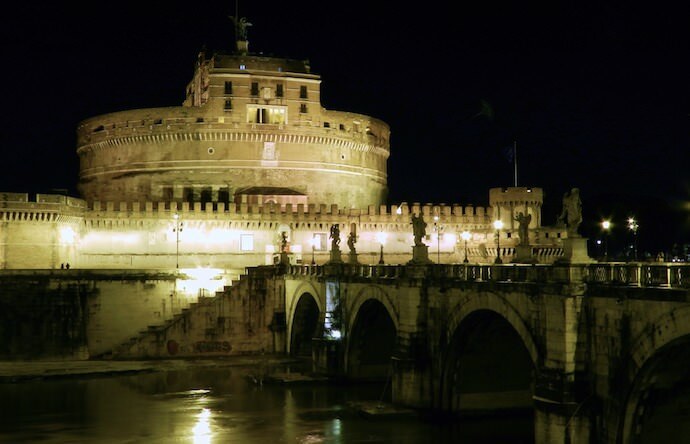 Castel Sant’Angelo: Following Via della Conciliazione, you will end up at the imposing Castel Sant’Angelo. Originally built as a mausoleum for the Roman Emperor Hadrian, it was later used by popes as a fortress [a passageway connects it to the Vatican], and now houses an excellent museum. Piazza Navona: Cross the Tiber using the statue-covered Ponte Sant’Angelo, and head east towards Piazza Navona, a space once occupied by the Stadium of Domitian. A series of monumental fountains dominate the piazza, and over-priced cafes line the edges. Depending on how late you are here, there may still be some tourists, but the overall feeling will be one of peace rather than chaos. 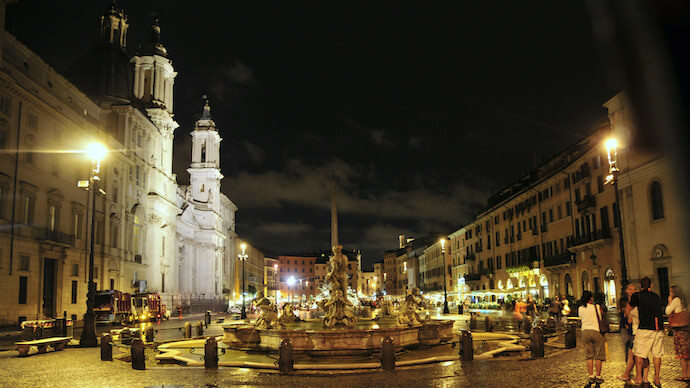 Elegant Piazza Navona at night. CC by SA-3.0--photo by Hanc1. Pantheon: Again head to the east, this time towards the Pantheon. Built in the first century AD as a temple to all Roman gods, it was turned into a Catholic church in 609. While the Pantheon is closed at night, you can still appreciate the building’s engineering from outside. Nearly 2000 years later, it still has the world’s largest unreinforced concrete dome. In front of the Pantheon. 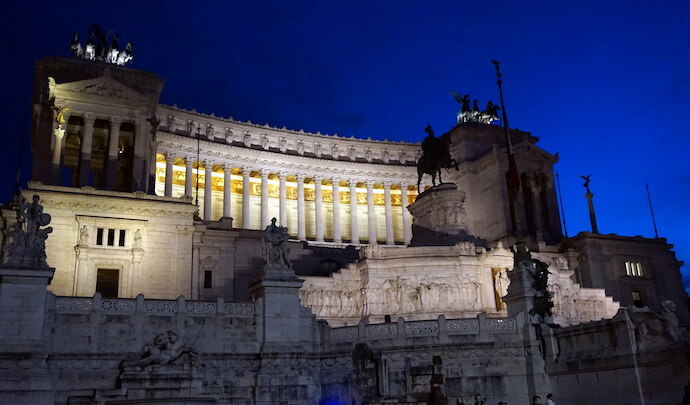 Piazza Venezia: Ten minutes to the south is Piazza Venezia, home to the impossible-to-ignore Altare della Patria. Erected in 1885 to honor Victor Emmanuel II—the first king of a united Italy—the building is highly controversial, to say the least. The glaringly white marble exterior stands out among the city’s predominantly earth-toned buildings. Many Romans even refer to it as la torta nuziale [the wedding cake]. An yet, it remains a must-see for all visitors to Rome. The ever-controversial memorial toVictor Emmanuel II in Piazza Venezia. CC by SA-2.0--photo by Matt Kiefer. 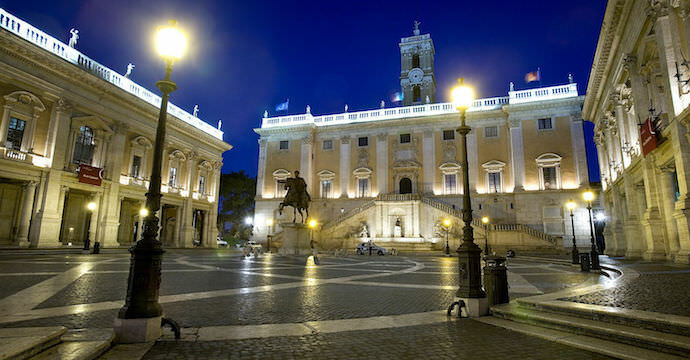 Capitoline Hill: Just behind the Altare is the Capitoline Hill, one of Rome’s most historic sites. Formerly the location of Rome’s most important temples, it is now capped by a grand piazza designed by Michelangelo. A modern copy of an ancient equestrian statue of the Emperor Marcus Aurelius stands in the center (the original is now in the adjacent Capitoline Museum). Head to the nearby Via Monte Tarpeo for a stunning nighttime view of the Roman Forum. This entire walk can be done comfortably in under 2 hours. And while it isn’t a substitute to experiencing these places in the daytime—you can’t enter any of the buildings at night, for example—it will provide you with a very different perspective on the city. -San Pietro in Vincoli: Just a ten minute walk from the Colosseum, this criminally under-visited church houses Michelangelo’s monumental tomb for Pope Julius II, who also commissioned the painting of the Sistine Chapel ceiling. 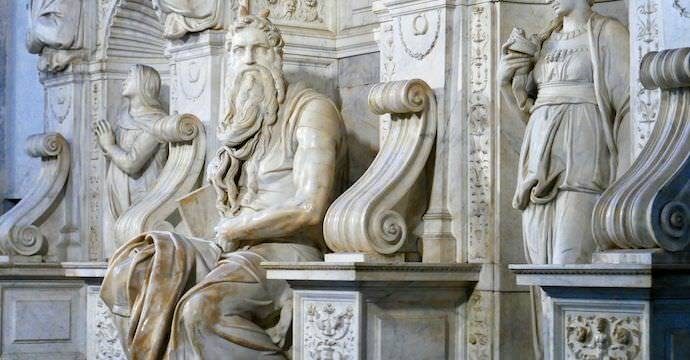 At the center is a sculpture of Moses, which Michelangelo considered his most lifelike creation. San Pietro in Vincoli—home of Michelangelo's massive sculpture Moses. -San Pietro in Montorio: Located on a hill behind Rome’s Trastevere district, San Pietro in Montorio is best known for the Tempietto, a commemorative tomb designed by the Renaissance architect Donato Bramante. More a work of sculpture than architecture, builders around the world quickly copied the Tempietto’s decorative style. 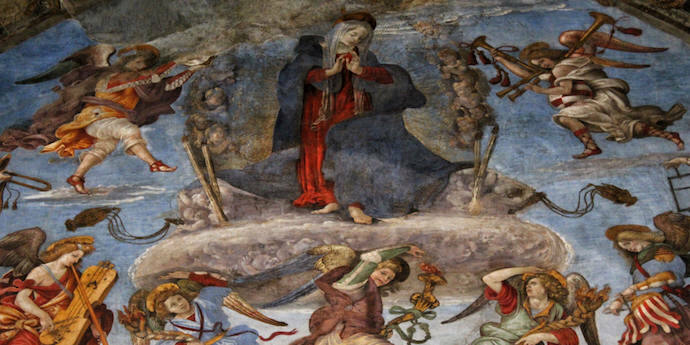 Sebastian del Piombo’s frescoes—found in the first chapel on the right—are also worth seeing. 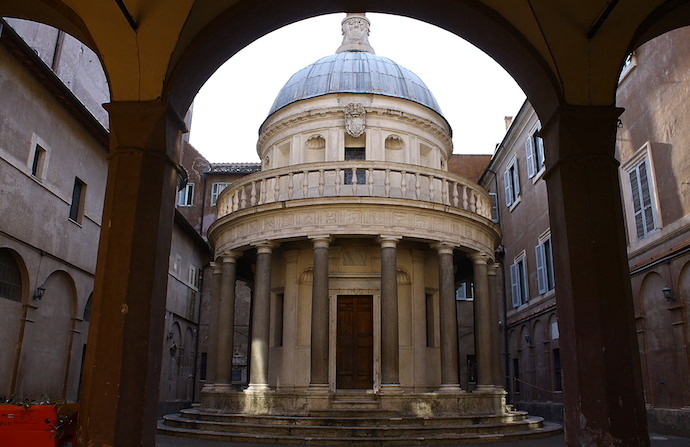 Bramante's sculpturesque Tempietto. CC by SA-2.0--photo by Bruno. -Santa Maria del Popolo: Despite being just ten minutes from the Spanish Steps, few visitors come to this beautiful church. Highlights include the Raphael-designed and Bernini-decorated Chigi Chapel, and the Cerasi Chapel, which contains The Conversion of Saul and The Crucifixion of St Peter by the sixteenth-century painter Caravaggio. The stark contrast between light and shade seen in the paintings, known as chiaroscuro, was revolutionary at the time. 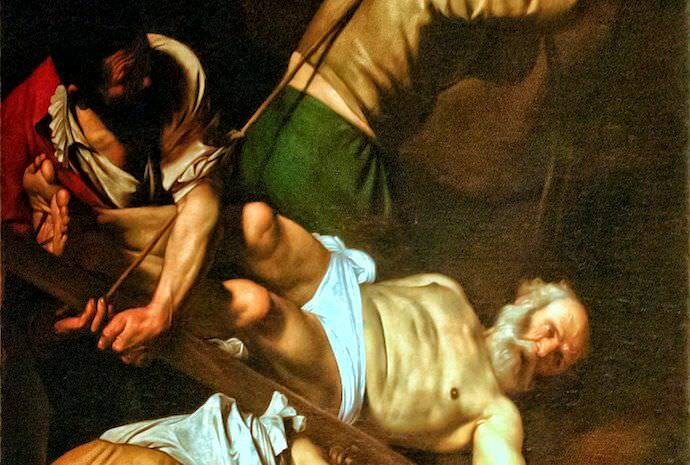 A detail from Caravaggio's masterpiece, The Crucifixion of St Peter. -Santa Maria Sopra Minerva: Just one block east of the Pantheon, Santa Maria Sopra Minerva usually contains more paintings than tourists. Of particular note are the frescoes by the Renaissance painter Filipino Lippi in the Carafa Chapel, and Michelangelo’s statue of Christ the Redeemer, located to the left of the main altar. Amazingly, you can view this work up close, as opposed to from behind bullet-proof glass, as is the case with his Pietà at the Vatican. The Assumption of the Virgin in Filipino Lippi's Carafa Chapel. Rome may not be world-famous for its greenery, but it does have a number of incredible parks that are both free of charge and a multitude of men wearing gladiator costumes. -Villa Borghese Gardens: Located just to the right of the Piazza del Popolo, the Villa Borghese Gardens is a convenient taste of bucolic life in downtown Rome. Originally built in the 1600s for Cardinal Scipione Borghese, the gardens house a number of elegant buildings, including the worthwhile Galleria Borghese. This also happens to be a favorite spot for local Romans! 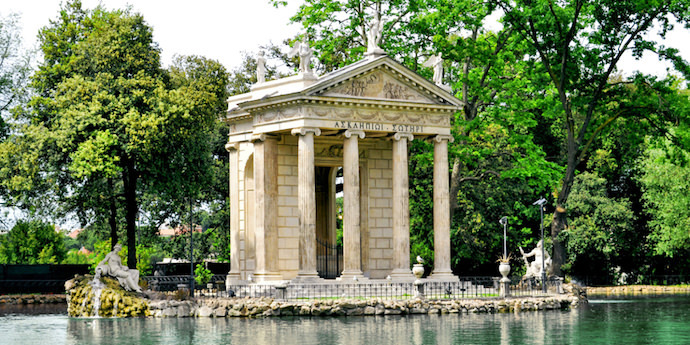 A decorative temple in the Villa Borghese gardens. -Villa Doria Pamphilji: Found just behind the Gianicolo Hill, the Villa Doria Pamphilji and its surrounding park offer an even more secluded and relaxing experience. Despite its central location, the park remains tourist free, instead being the choice place for Roman families on a sunny day. The gardens at the Villa Doria Pamphilji. CC by SA-2.0--photo by Burkhard Mücke. -Villa Celimontana: Further afield is the Villa Celimontana and its gardens. Get lost among the greenery and enjoy the ancient carved marbles found throughout the park. During the summer months, you may even stumble upon one of the evening jazz concerts held here. 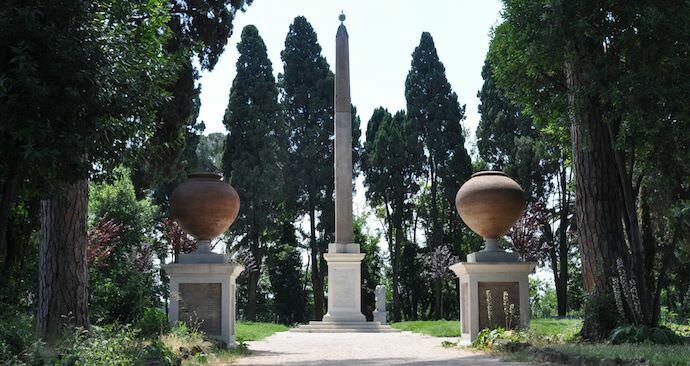 An obelisk in the gardens of the Villa Celimontana. CC by SA-2.0--photo by Kristof Verslype. Overlooking the Tiber in the offseason. Like many cities in Europe, Rome completely changes during the offseason. Prices for accommodations go down, the weather becomes mild, and the masses of tourists largely disappear. I remember being there in March of 2013, on the weekend of Pope Francis’ inauguration. I had expected long lines and increased prices, but I found neither. As such, the easiest way to save money and avoid crowds in Rome is to visit in the offseason, or roughly from October to May. In contrast, July to September have the highest tourist numbers, with August being the top month. If you really don’t like crowds or the heat, stay away from Rome in August at all costs! As you can see, a visit to Rome doesn’t have to mean spending lots of money or battling crowds. 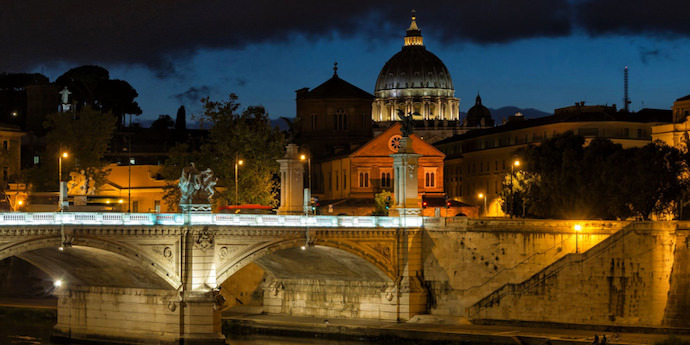 By discovering some of the lesser-known churches, exploring the city at night, hiking the Gianicolo Hill, heading to a park, or visiting in the offseason, visitors can appreciate Rome’s historic and artistic beauty in peace without destroying their budget.